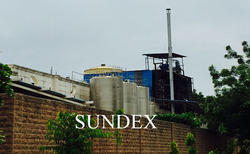 Leading OEM Manufacturer of canola solvent extraction plant, cotton seed solvent extraction plant, solvent extraction plant, peanuts solvent extraction plant, expander and enhancer system and sunflower seed solvent extraction plant from Mumbai. 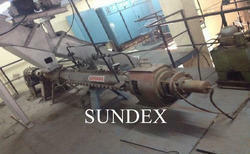 Canola Solvent Extraction Plant are (Canola) seeds contains more than 45% oil. The major oil is recovered by mechanical pressing in screw presses. The seeds are subjected either to pre-pressing in screw presses leaving left over residual oil in the cake in the range of 16 to 20% or the seeds are subjected to full pressing in which case oil left over has residual oil in the cake ranging between 8 to 10%. The cake is subjected to solvent extraction for recovery of the residual oil. Cotton seeds need specific preparation before extraction. Cotton Seeds Solvent Extraction Plant have to be cleaned to remove foreign particles, de-linted to remove the lint’s, decorticated for removing the hard husk and the resultant meat obtained contains about 35% oil. The meat is subjected to mechanical pressing. The first portion of the oil is removed during mechanical pressing, the resultant cake with residual oil content ranging from 8 to 12% is sent for solvent extraction. The solvent extraction of pre-pressed cotton seed cake is like normal solvent extraction of any pre-pressed cake. Solvent Extraction, as the name suggests is a process to extract the oil from oil bearing materials by means of Solvent. 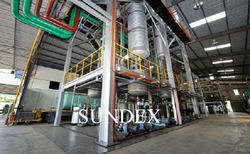 Solvent Extraction Plants offered by sundex are versatile in operation. Any oil bearing material after subjecting it to recommended preparation can be extracted in the same Solvent Extraction Plant. Special preparatory equipments are recommended to suit individual characteristics of raw materials. 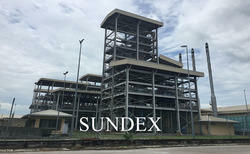 Sundex’s proven design is simple, robust, operator friendly flexible for easy change over of the process material and with inbuilt safety features. 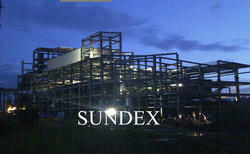 Sundex plants have been operating with good results for almost two decades and more. 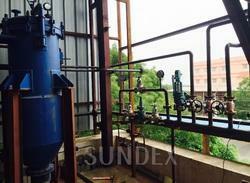 Peanuts Solvent Extraction Plant are first decorticated to remove the husk. The kernels so obtained have an oil content in excess of 48%. The kernels are subjected to mechanical extraction with the help of screw presses. The resultant cake has residual oil content varying from 8 to 12% depending on the extent of pressing. The pre-pressed cake is subjected to solvent extraction process for recovery of the residual oil. Expander and Enhancer System provide the Oil seeds are properly cleaned & destoned before further processing. Properly cleaned & de-stoned oil seeds are subjected to size disintegration/flaking to get better efficiency of the machine. This disintegrated seed is subjected to Cooking. Sunflower seeds contain more than 45% of the oil. The seeds are first subjected to decorations to obtain high protein meal, the domesticated Sunflower Seeds Solvent Extraction Plant are subjected to mechanical extraction. In one method only pre-pressing is carried out leaving 18 to 20% as residual oil in the pre-pressed cake. In the second method full pressing is carried out in screw presses leaving 10 to 12% residual oil in the fully pressed cake. For recovery of residual left over oil in the cake, the cake is subjected to the solvent extraction process. ever any phosphates present in the feedstock will char at the high temperature used for steam refining deodorizing. It claimed that a crude rice bran oil suitable for steam refining deodorizing can be prepared by water degumming followed by phosphoric acid treatment.